This route 70 foot route climbs the severely overhanging West face at the only possible weakness on the wall. It follows a slot/dihedral that starts some 30 feet south of the North West corner of the rock. The start is best reached by following the trail between the First and Second all the way up and skirting around the North side of the Sunset Flatiron. It is a nice extra credit after completing routes on either of the First or Second Flatirons. 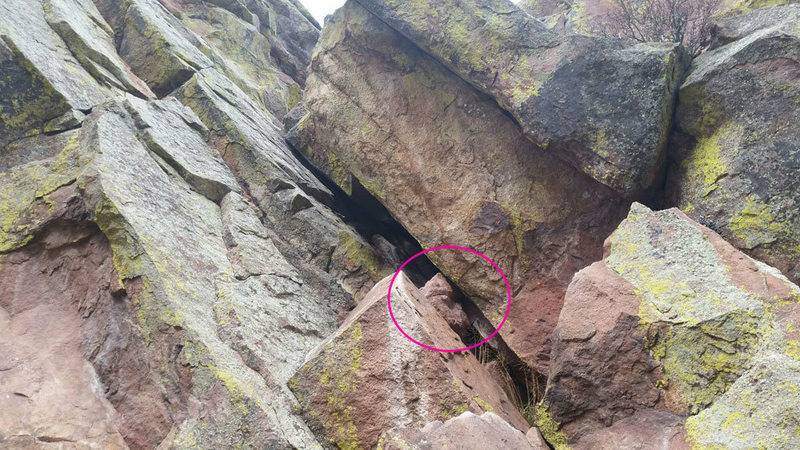 Start at the base of the slot and climb past three cruxes/bulges. Each requoring different technique. The route protect very well. Once you reach the ridge scramble 10 feet North (left) to the summit. Descent - downclimb East to easier territory and eventually onto the trail. You can see the Sunset Flatironette on the picture just left of the first. This is a view from the Third. Standard rack, #3 Camalot will come in handy. Erik W leading Pack Rat. Erik W getting off the ground on Pack Rat. A couple moves off the ground, what was once a chockstone is now a death block. If it were me, I would not trust the big wobbly chockstone as a hold anymore. I would not want to be the poor soul that pulled on that thing and sent it flying. Honestly, there are just so many better routes all around in the Flatirons that it's probably best to avoid this one until the death block is gone. It's manageable though, as you would start on the S. side of that pyramid block just below it, and traverse N. to gain easy access to the slot, using the top of the pyramid black for your hands.